Thank you for all of your thoughts and prayers while I was literally in “no man’s land” between Iraq and Syria. More correctly, I felt that I was on “God’s land” – space that did not belong to either country. Isn’t all land God’s land? Borders have never seemed more absurd to me. And the inability to enjoy freedom of movement has never felt more frustrating and tragic. But I have to start at the beginning. 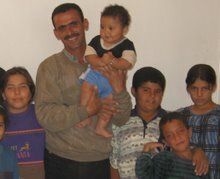 By now, those of you who receive CPT Iraq updates know that the people CPT accompanied to the Syrian border were Palestinians fleeing persecution in Iraq. To be clear – the people are Palestinian in ethnicity, but they were all born in Iraq. To those of you who are Americans, this may be confusing, since if you are born in the United States, you are automatically an American citizen. Not so in many other countries. Palestinians born in Iraq are Palestinian. They are not Iraqi citizens and therefore do not enjoy the rights and protections of citizenship. They cannot vote, hold office, own firearms, buy a house or car, or be employed by the government. They do not have passports, and must apply to renew their residency in Iraq (the country of their birth!) every two months. They have travel documents in lieu of passports, but the countries that border Iraq do not accept these travel documents and so, for all intents and purposes, Palestinians are stuck in Iraq. For political reasons, basically to display his pan-Arab nationalism, Saddam Hussein made a public show of supporting Palestinians in Iraq. Television announcements during his rule said that Palestinians received free cars and apartments. Much of this was propaganda. Palestinians in Iraq suffered the same fate as Iraqis – years of war and sanctions. However, because Saddam appeared to favor the Palestinians, Iraqi public opinion turned against them in resentment, especially after the fall of Saddam’s regime. Thousands of Palestinians who did live in subsidized housing were kicked out of their apartments after the war began in 2003. In recent months, the new Iraqi security forces, including commando groups like the Wolf Brigade and Scorpion Brigade, have been raiding Palestinian homes, detaining and torturing Palestinian men, and threatening the lives of the community. Of course, Palestinians are not the only people in Iraq who suffer at the hands of the new Iraqi security forces – CPT has documented cases of torture in other communities. But Palestinians as a group are being targeted. Along the dangerous road between Baghdad and Syria, we became one family. I will share this family with you now, bit by bit over the course of the next couple of weeks. We sat in Tha’ir’s living room in the Palestinian compound in Baghdad. I had been here several times before, always to hear a sad story, or to meet a sick Palestinian child who had difficulty getting treatment at Iraqi hospitals because of his nationality. A few months ago, three brothers in this community were detained by Iraqi commando groups, tortured, and forced to confess to crimes they did not commit. The confessions were aired on a popular Iraqi TV show called “Terrorism in the Grip of Justice,” in which often bruised men, before being put on trial, describe the terrorist acts they have allegedly committed. When am I? Wasn’t the fall of Saddam’s regime supposed to signal the end of state-sponsored torture? 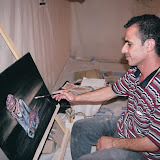 He began interviewing people in the community who had lost relatives to the Iraqi security forces. One was an elderly widow whose husband was detained, tortured, and killed. Tha’ir also collected statements from two hundred Palestinian families, asking them to write on the backs of their food rations cards to prove that the statements were legitimate. The statements ask the UN to help Iraq’s Palestinians find refuge in other countries. What to do? The road to Syria, according to our Iraqi colleagues, was fraught with danger. “It is lawless,” said one translator. Bandits, thieves, maybe terrorists have free reign. But this is what CPT is about – accompanying people through danger, especially when our foreigner status allows us to “get in the way” of violence and provide some measure of safety. “We will go with you or without you,” Tha’ir said. But by then, we all wanted to go. It took some days of decision-making, and in the end we decided to send three CPTers on the bus. I felt afraid. Here I had thought I would get out of this country alive, and now I might not. But I knew, deep inside, that these people were my brothers and sisters. If they were going to take the risk, then I wanted to be with them. We talked with Tha’ir and the people about various possibilities. Our foreigner status might help them get through the ING checkpoints, but if the bus was attacked by bandits in the desert, our foreigner status could be a huge liability. And so our family prepared to travel. In the wee hours of October 4, I heard the “clang clang clang!” of someone walking the streets, beating a metal drum to call people to eat the pre-dawn meal. It was the first day of Ramadan, the beginning of the month-long fast for the world’s Muslims. I, Maxine, Bob, Beth and Tom had slept at Tha’ir’s house, to be ready to set out first thing in the morning. The night before, we had learned that many of the families had opted out of the journey. The Palestinian ambassador had told Tha’ir that if the bus traveled, he would call the Iraqi National Guard (ING) to stop it. Most of the families were afraid. I felt afraid too, but we had promised, and we decided to go through with the plan as long as any families wanted to take the risk. For the first time in months, I was dressed like a foreigner – blue jeans, long shirt, and bright red CPT hat. We hoped that when the ING saw foreigners, they would let us through. When I got on the bus, the first thing I realized is that the families included several small children and a grandmother. There was Mohammed and Luma, a young couple newly married. Hussain and Siham held their one-year-old baby, Ali, the fattest little one I had ever seen! 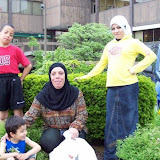 Temam, Siham’s elderly mother, accompanied them. Sitting across the aisle was Sabri and Fatima and their two children: Ahmed, age 13, and Deema, age 8. The largest family included the children of Maher and his wife Elaf: Yousra, 13, Aiya, 12, Mohammed, 8, and little Mahmoud, age 1. Three single men, including Tha’ir, Ahmed, and another Mahmoud, made the group one large “family” of nineteen refugees. I and Beth and Tom joined them with our young Palestinian translator *Ibrahim, as well as Sami, an Iraqi American and member of Muslim Peacemaker Teams. We waited for an hour before the bus pulled out into Baghdad traffic. It was tense. Would we even get out of the city? One half-hour later, at the checkpoint on the outskirts of Abu Ghraib village, we got the answer. An ING soldier ordered the bus to pull over. When the door opened, he asked for the passports of everyone on the bus. “What should we do?” I asked Ibrahim. “I don’t know!” he replied, afraid that if the soldier knew they were Palestinians, he would detain them. Sami was too far away to translate. I don’t know how I did it, but I stood in the bus’s door, showed my U.S. passport to the soldier, and said in Arabic, “I’m part of a human rights organization. We are with these people, and we know them. They are good people, there is no problem.” He looked at the passport for a minute, then nodded and waved us on. The rest of the journey was like a dream. As we passed Fallujah, Sami called a sheikh we know there and told him about the trip. He wished us a blessed Ramadan and asked us to visit Fallujah again soon. After Ramadi, we foreigners put on Muslim dress and blended among the families. Little Deema sat next to me and chattered away in Arabic, most of which I could not understand. Baby Ali stuck his tongue out at anyone who made faces at him. Some of those who woke up have chosen to seek refuge beyond the warzone. It is too soon to tell if this exodus will reach a promised land. It is too soon to tell when the sojourn in the desert will end. When we reached the Iraqi border, we met with an immigration official, because some of the Palestinians did not have proper travel documents. “I can’t help you,” he said. “OK, I will do what I can,” said the official. “But I cannot promise that the Syrians will help you on their side of the border.” It was like magic: instant brotherhood. Tha’ir kissed him on the cheek, a traditional gesture of friendship in the Middle East. I wish that official knew what treasures we had brought. There was Maher and Elaf and their four children, and the story of why they took this drastic step. “We’ve been harassed in Iraq,” Elaf told me the next day. “One morning at 3am, Iraqi soldiers barged into the house, looking for someone named Saddam. They dragged my husband half-dressed out of the house. They pointed a gun at my daughter’s head. They began shooting at the house. From time to time, they come back. This has happened more than three or four times. Life for us is too difficult. Sometimes we only have enough food for breakfast.” Their littlest one, one-year-old Mahmoud, had diarrhea on the trip from Baghdad. I watched as his father mixed together a salt solution to prevent dehydration and spooned it gently into the baby’s mouth. Courage. I wish that the Syrian official had realized the treasure present in this community. As it was, he banished us all back to Iraq. But we went outside and camped on the sidewalk, in no man’s land, for the night. All I had was a sheet, but Luma gave me a sleeping pad, Tha’ir insisted on giving me a blanket. I slept with the women in a flatbed truck, open to the stars. In the desert, the stars are so bright you can see the Milky Way. After a night under the stars, the hard reality of life on the sidewalk of a border crossing hit us all too soon. Desert in all directions, by 8:15am we were already beginning to bake in the sun. A truck driver took note of the women and children, and moved his lorry so that it cast a swath of shade over the 50m of sidewalk we occupied. The babies gurgled. More trucks roared past, shrieking brakes and horns. The smell of tar and gasoline hung in the air. We waited on the sidewalk, bags strewn around, to see what would happen next. My Christian Peacemaker Teams colleague Beth and I used the time to interview more of our fellow travelers. Ahmed, 44, with prematurely white hair, calm eyes, and a prominent nose carried himself like a dignified general, despite slight paralysis from a shrapnel injury he suffered during the bombings of the first Gulf War. One of the few single men in the group, he told us that he had spent the entire past year within the Palestinian compound in Baghdad, afraid to leave his neighborhood for fear of getting stopped and detained by the Iraqi National Guard (ING). In between interviews, we actually did take calls from various UN offices. The UNHCR (United Nations High Commission for Refugees) office in Syria called most often. They were especially worried about the children, and said that they would try to provide material aid soon, but that they could not help us gain entry to Syria. In the midst of all this, a Syrian immigration officer approached. Oh no. They know we did not go back to Iraq. What now? By some miracle, perhaps because we internationals were present, perhaps because the UN knew about us, the Syrian officials did not deport us back to the Iraqi border. Instead they moved us into a small stone hut, about 10m x 7m, next to a guard house at the border’s gate. Its window looked out onto the raw desert. Guarding them as the apple of his eye.” (Deut 32: 10). The following are excerpts from the journal I kept during our two weeks in “no man’s land” between the Iraq and Syrian borders. October 5: Ann Mayman, a representative from UNHCR, arrives and is aghast at the living conditions. While she tries to interview Tha’ir and other refugees, she has to pause often amid the roar of trucks and stench of exhaust. “This is unbearable,” she says. “We will try to find a solution. But I have to tell you that it may take a long time.” She says she will try to bring tents, and will arrange for UNHCR to pay for two meals per day for the group to eat at the border’s cafeteria. Tha’ir tells her about the torture, the killings. I wish I could hand her documents, evidence. The people in front of her will have to be proof enough. She interviews the women separately, and they ask for diapers and diarrhea medicine for the babies. 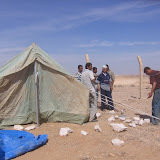 October 7th: UNHCR people returned and brought us three tents! We feel like we are in five-star hotels, because we can sleep all stretched out. The women and children of three families are still tumbled together in a single tent, but it is roomier than the hut. I have interviewed people countless times in tents like this. Now I am living in one, even if for only a few weeks. How long will it be for them, my Palestinian family? I can barely touch the horrible pain they will feel if they are ultimately denied entry into Syria or any other place. The defeat – I cannot imagine it. God, will it be 40 years in this desert too? October 8: The kids run races in the dust. Beth teaches them “Red Rover.” I am falling in love with baby Mahmoud. He woke up from a nap the other day and his mom was outside, so in distress he held up his arms to me and captured my heart! I play with the other children too, but not as energetically as Beth, and they accuse me of being tired all the time. It is amazing how tired I become sitting in on these testimonies with the UNHCR, calling embassies, trying to notify the press. I think I feel tired because so much is riding on it all. If these people get turned away in the end . . .
October 9: Beth and Sami returned to Baghdad today. The CPT team there needs backup. Last night, the men bought chickens to make the dinner special, and to supplement the usual fare of hummus, vegetables and rice. Tha’ir wrote a letter thanking Beth for all she had done for them, and everyone in the camp signed it. Some of the kids wept, especially Aiya, who calls Beth her second Mom. 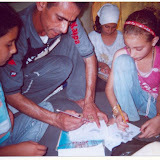 October 10: *Ibrahim and I started a “tent school” for the five older children. I’m fumbling through English lessons, he teaches art. Today we did a lesson on weather words and sang the “Itsy-Bitsy Spider” song. After school we called more embassies. The U.S. embassy people said that they could only help us Americans (just me and Tom, now). But the people I talked to at the embassies of Switzerland, Great Britain, and Spain were very concerned and wanted to be kept posted on what happened. In the afternoon the men organized a game of soccer. It was as if they were suddenly transformed into boys, laughing and arguing over the score, and kicking up enormous amounts of desert dust as they played. October 12: Little Mahmoud is sick again, with a combination of influenza and asthma. Most of the adults are also coughing and sneezing. It’s so cold at night, but at least 95 degrees during the day. The meals the cafeteria serves us are not balanced – all rice and vegetables, no fruit and not enough protein. I worry about the kids, it’s not adequate for them. Tent-living is getting tough as well. The family tent was too crowded for the children, so we CPTers made a partition in our tent for Luma and her husband Mohammed. Every morning, Luma reaches across the partition and hands me some bread and cheese, or 7-up or juice. She insists on feeding me no matter what. Hussain, who is a barber, cuts the men’s hair and gives Tom a shave. He wants me to take a picture of his work, shaving Tom with the desert sun beating down. Later he gives free haircuts to all the workers in the cafeteria. The “school” is humming along. We sit outside the tent on a blanket, crouching in the patch of shade left by the awning. Today we sang the “Head, Shoulders, Knees and Toes” song. Maybe tomorrow I will teach them the “Hokey Pokey.” Yousra and Ahmed are fast learners and will be great at English if they keep studying. Aiya is quiet and eager to please, but Deema and Mohammed are holy terrors and Ibrahim and I refer to them as “our menaces,” like Dennis the Menace. October 14: Today I asked Tha’ir what we could do to help – embassy calls, whatever. “It’s Friday,” he said. “We’ll rest today.” He spent the morning with the children, teaching them magic tricks with coins and matchsticks. They then begged to play volleyball, which we managed with the soccer ball provided by the UN and a makeshift clothesline strung up between two posts. I cannot believe how freely these people can laugh and play, despite all that they have experienced and may still face in the uncertain future. October 15: I am sick now, too. Influenza. The days blend together. Wake early with the sun. 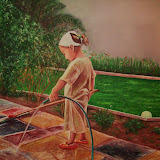 Try to reach the outside world by mobile phone. Teach English in the shade of a tent. Sleep through the hottest part of the day. Drag oneself through the heat to lunch, then rest again before tackling laundry, cleaning the camp, occupying the kids with sports, taking the sick babies to the border clinic. Evenings we all light a fire and talk, then back to the cafeteria for supper and the end of another day. When will it change? When will we get the glorious news that some country in the world will welcome these people? October 17: My last day. Tom and I have to leave and return to the team in Baghdad. In the last few fire-lit talks, the community has expressed fear at what might happen to them when we leave. But Tha’ir reassures them and us. “We will rely on ourselves now,” he says. 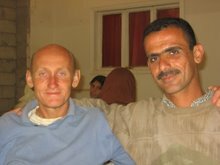 Tom and I promise to do all we can to prevent further violence against their Palestinian communities in Baghdad, and to insist on positive changes from the Iraqi and American governments. I started crying when the car pulled away and began the three-hour drive to Damascus, where Tom and I would take a plane back to Baghdad. I’ve never felt more deeply that I was leaving my own family behind. 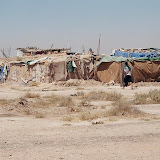 In late November 2005, the refugees were allowed to enter Syria and go to a UNHCR refugee camp in Al Hol, far in the north. However, they do not have freedom of movement or employment. They are confined to the camp, which was built for Iraqi families fleeing the first Gulf War. They live in clay houses with no running water and without adequate heat. UNHCR provides them with simple rations (rice, beans, bread, oil, tea, and a few vegetables) but if they want a balanced diet they have to supplement the rations with food they must buy themselves. All are poor with few resources, and the largest family is destitute. 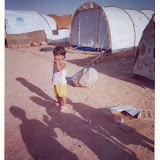 I visited the refugees in the UNHCR camp for a two weeks in December 2005, and again in August 2006. Over the winter of 2005-2006, hundreds more Palestinians fled Iraq, as neighborhood attacks, disappearances, torture and murder increased. Syria eventually allowed about 300 more Palestinians into the UNHCR camp. However, the border is now closed. Syria will not allow any more refugees in, and Jordan, Iran, Turkey, and Kuwait will not allow any Palestinian refugees from Iraq to cross their borders. At this time, about 350 additional Palestinian refugees from Iraq are stuck in no-man’s land between Iraq and Syria. Comprising a majority of children and women, they have been there for more than six months and face a harsh winter living in tents in a scorpion-infested desert. 700 more languish in a new camp just inside the Iraqi border. The approximately 20,000 Palestinians still in Iraq, most of whom live in housing projects in Baghdad, live in constant fear.